Badminton England has created a survey regarding disability badminton for Players, Coaches and Clubs. Please take a minute to fill in the survey which will prove very useful information for Badminton England to use to to go forward and develop Disability Badminon into the future for all users and visitors. Take part, you will be helping to make Disability Badinton better for everyone. Give Wheelchair Badminton a go!!! This clip of Nicholas Coombs enjoying wheelchair badminton is what it is all about. Get involved, give it a go, I am sure Nick would tell you it is hugely enjoyable. Emma Stoner had her first Para-Badminton international experience in Rodez, France. 'On Monday 29th October, I left very early in the morning with my mum to go to the European Para Badminton Championships in Rodez, France! I was really exited and nervous at the same time as it was my first international and I was also very proud to be representing England! On The Tuesday I was classified as SL4. On the Wednesday, the tournament started. I had my first match with Bobby Griffin playing in the mixed doubles against a very strong German pair. Bobby was extremely supportive and I couldn’t have asked for anything more! We lost the match, however it was only our second match playing together as a mixed pair, the first being at a Wimbledon Senior Para badminton tournament in 2015!!! In our second match we played really well, winning the match quite comfortably! Later on in the afternoon, I had my first singles match, against one of the previous winners Katrin Seibert from Germany. It was a very tough match but I was really pleased with my performance and I even managed to take 15 points off her in the second game!!! On Thursday, the ladies doubles started. I was playing with Veronique Broad from France, who had lots of experience so I picked up lots of doubles tips.We also had the support of the home crowd in our matches, who were very noisy!!! I also had a few more tough singles matches. On Friday, we had another doubles match, which we won!! I was very pleased with my performance and we had a very loud cheer afterwards! My next match wasn’t till late in the evening, one of the last matches on for the day. It was the mixed doubles quarter finals! We had to play against my doubles partner! They were seeded so we weren’t expected to win but I really enjoyed playing the match with Bobby and it was a fantastic experience and it was very exciting to find myself in the quarter finals in my first international!! Emma joined our weekly disability badminton sessions, at the club, when she was just 8 yrs old. At that time she was a reluctant participant, but, with a little persuasion we soon turned this around and she has made great strides since! When Emma was just 10 yrs she competed in Surrey’s first senior Para-badminton tournament. Emma, at the time, knew that it was unlikely that she would win any games, but, this did not phase her in any way. I was so impressed by her attitude and the way she was able to focus and try to win every point she could. Last year she was runner up in the ladies doubles event! In the last 3 years Emma has been attending the monthly Talent Spotting disability badminton Sessions at the club. These are sponsored by The Anders Foundation and were set up to aid promising youngsters, aged 8 – 18 years, gain access to more intense coaching which would eventually steer them along the performance pathway. These sessions were set up to talent spot youngsters who have good hand-eye co-ordination but have a disability, physical or learning. In addition to these sessions, Emma joined the Raw Performance weekly junior sessions at the club. Playing alongside talented able-bodied players has been key to her most recent success. 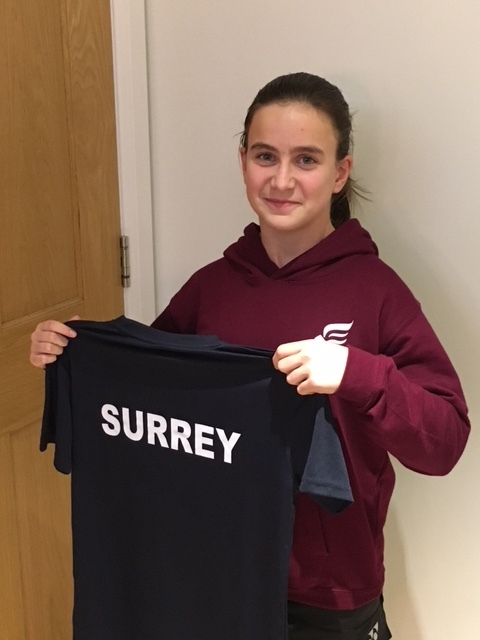 In the last year Emma has entered local Surrey junior events and has come runner up twice in the u14 girl’s singles tournament. Emma’s disability only requires her to play on a half court but she is competing and winning, against able-bodied players on a full court. This will stand her in good stead though as her classification may change. She is also playing doubles in these events which will give her invaluable experience in the future and will enhance her progress as an all-round event player. As a result of her success in Surrey, just recently she was invited to join the u14 squad for weekly training, and, soon after, was quickly selected to play for their second team. Her match results have been so astounding that she has now been selected for the first team! We are all very proud of Emma’s work ethic and sheer determination to give her very best each time she steps on the court. Her disability has never held her back. There is no doubt in my mind that she has all the vital components of a true champion and is part of the new wave of players coming through, who will go on to represent England in para badminton!!! 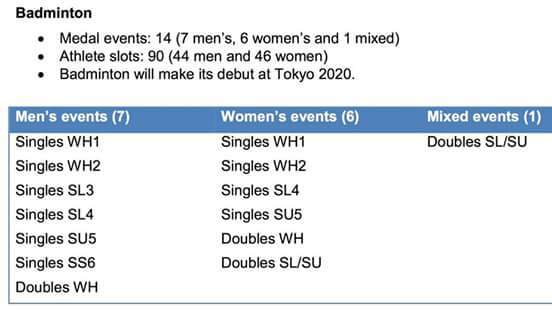 The categories and events for the debut of the Paralympics has been announced on the 4th September 2017. Here is the 2019 Para Badminton Calendar.